Cosmic echo studies show Eta Carinae blast not as hot as believed, so what triggered it? 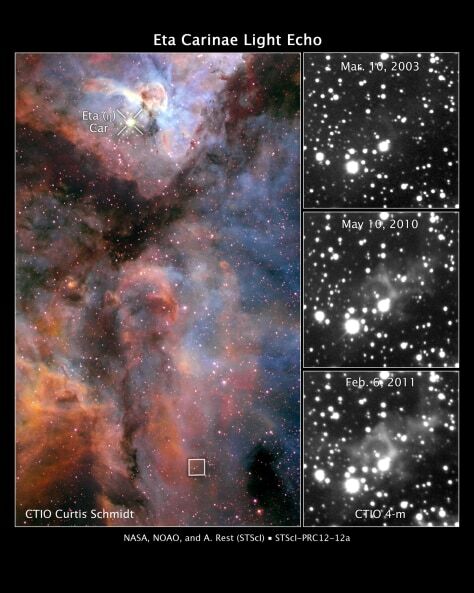 These images, released Wednesday, reveal light from a massive stellar outburst in the Carina Nebula reflecting off dust clouds surrounding a behemoth double-star system, a phenomenon called a light echo. Astronomers have used the echo to learn the Great Eruption of star eta Carinae in 1838 was not as hot as previously thought.